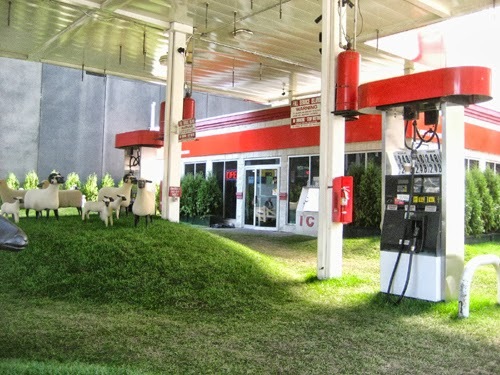 This bucolic scene, with green grass and 25 grazing moutons by the late sculptor François-Xavier Lalanne, has been installed on the site of the former Getty station at the corner of Tenth Avenue and 24th Street in the heart of Chelsea. Its appearance can mean only one thing: The lot is about to be developed. 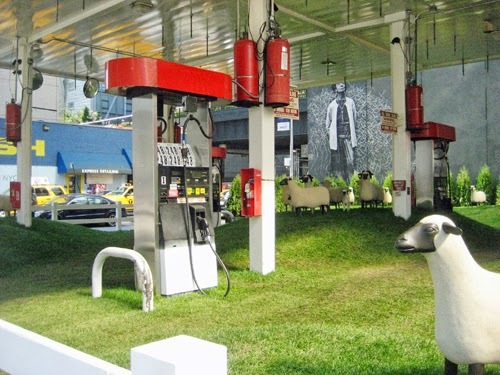 According to the handout available at the site, this "public art program [was] . . . conceived by real estate developer and art collector Michael Shvo to bring outdoor exhibitions to a broad audience in the center of the High Line arts district." So generous of Shvo to bring art to Chelsea. There's so little of it there. Keep reading the handout and you come to this: "The Getty filling station . . . will be transformed to the premier collection of luxury residences near the High Line." Shvo is not the only developer making the neighborhood safe for the super wealthy--the 20s between Tenth and Eleventh Avenues are screeching with the sound of development--but he's the only one doing it in sheep's clothing. Chromatic Geometries, up through the end of the month, is my seventh solo show with Arden Gallery in Boston. I've been involved with the diamond shape for a couple years. In this new body of work--a continuation of the Diamond Life series I've been working on plus a new series, Chromatic Geometry, which has given the show its title--I started by fracturing the diamond into a planar crystalline structure and improvising from there. You can see images here, directions here. I'm pleased to share two excellent reviews about the show.
. In the current issue of Artscope, a New England-based art magazine, Elizabeth Michelman writes, "Her game is formal as she determines what kinds of color relationships to set in motion and how to balance or destabilize them from within the geometrical structures that hold them."
. In Two Coats of Paint, Sharon Butler's widely read blog, Butler writes, "As usual, Mattera demonstrates tremendous mastery over her materials and a seductive approach to color, while introducing some quirky compositional strategies. Although she usually discusses her work in terms of formal exploration, the timeless fascination of the figure-ground reversal that points to our shifting notions of meaning and perception is compelling on a metaphorical level as well."